According to Joanne Blythman’s book “Bad Food Britain”, which I have just finished reading, something dramatic has been happening to our collective cooking knowledge and skills over the course of a couple of generations. Fifty years ago the average British family meal took 1 hour and 20 minutes to prepare and cook. By 1980 that figure had dropped to an hour. Now it takes on average just 13 minutes to prepare and cook the average family meal. For someone, like me, who delights in the process of cooking and creating a meal these figures are truly disconcerting. However, even I can understand how, as our lives have become more busy, time has increasingly become a precious commodity. As a result, it seems, we are reaching more and more for products that help us produce meals quickly and easily. These range from the takeaway, through the microwaved ready meal, to the jars of cook-in sauces, powdered gravy granules, ready cooked Yorkshire puddings and so on. Over time, we have become more and more dependent on these short-cut sources for our daily meals. Apart from the fact that many of these takeaway meals, cook-chill meals and processed foods contain possibly harmful ingredients, such as the pervasive high fructose corn syrup, most of them are also produced and controlled by unaccountable, powerful global food corporations, whose profits are being bolstered by our culinary indifference. Just as worrying, I believe, is the fact that our reliance on these products will only further diminish our collective cooking skills and knowledge over the long term. And those children whose parents don’t or won’t cook will very likely grow up never questioning where their food comes from and unable to cook for themselves, perpetuating this sorry decline. Sorry, that was a bit miserable, even for me. Let’s lighten the mood with a recipe. For this one I am using some locally foraged wild garlic. You will usually find wild garlic growing in damp and shady areas, particularly woodland. It is prolific although its season is relatively short, and it is at its best right now. If you do go foraging for wild garlic, please only collect what you need and pick just the leaves, don’t uproot the plants. 1. First, make the pastry. Put the flour, salt, caster sugar and butter in the bowl of a food processor and mix at the lowest setting until it looks like fine breadcrumbs. Add the egg and the water. The mixture should form into a pliable ball. If necessary add a very small amount more water, a little at a time. Remove from the food processor bowl, flatten the ball slightly to a thick disc shape (this makes it easier to roll out later), wrap in clingfilm and put it the fridge for 30 minutes. 2.Pre heat the oven to 175˚C (350˚F, gas mark 4). Grease four individual tart dishes. Retrieve the pastry, divide into four and roll out each piece thinly, placing it carefully over a flan tin and gently pressing into place. Trim the pastry so that there is a slight overhang of about 1 cm. Prick the base and sides of the each flan pastry base with a fork and line it with parchment and baking stones or beans. Bake blind in the preheated oven for 10 minutes. Remove from the oven, leave to cool slightly and then remove the parchment and baking beans. The edges of the flans will have shrunk slightly, but now you can trim them neatly to the height of the flan dish with a sharp knife. 4. Whisk the eggs with the sea salt and cream until smooth and creamy. 5. Pour a thin layer of the cream and egg mix into the base of each tartlet. On top of this evenly sprinkle a thin layer of the grated cheese, followed by a layer of the chopped garlic leaves. Repeat this process once more to bring the egg and cream mixture to just below the height of the tartlet pastry shell (the wild garlic is quite springy and will stand proud before it goes in the oven, but don’t worry), ending up with a thin drizzle of the egg and cream mixture. 7. Place in the pre-heated oven for around 20 minutes until set and golden. Leave to cool slightly. Serve while still warm with a simple salad. Just 13mins? That’s genuinely, a huge surprise to me. Oven chips take longer than that to heat up! I just can’t imagine how that even works unless the majority of people’s food is comprised of ready meals going straight from the chiller cabinet and into the microwave. Or indeed straight from the takeaway onto a plate. Somewhat ironic when you contrast that figure to the vast array of cookery programmes we have littering the schedules (or at least had when I watched TV, I haven’t had TV for some while now) – are people watching cookery programmes instead of cooking rather than as well as cooking? As for lost skills, I had to teach myself to cook when I turned vegetarian in my teens – as my mother didn’t have any cooking skills to pass onto me herself, though fortunately my gran taught me how to bake which helped get me started. Of course lots of people don’t have the time they might otherwise like to spend on cooking; I’m a big fan of batch cooking and freezing myself, it takes a little more planning and forethought, but if you’re organised it can be a useful time saving way to avoid living off of those little plastic trays covered in film.. I guess the thing with oven chips is you can tip them onto a baking tray, pop them into the oven and then go off and do something else – watch TV, change your Facebook status etc, while they are cooking. The total time spent actually physically preparing and cooking them is pretty minimal. You are absolutely right to point out the huge irony of a nation of people who, it seems, do not spend very much time at all cooking, and yet are hooked on TV cookery programmes like “MasterChef”, “Come Dine With Me” and the like! Thanks for showing the photograph of what wild garlic looks like. As I walk around the countryside I can smell it. Now I will know what to pick. Am going to read Bad Food Britain. I wonder if the stats for the time it takes to prepare a meal in France or Italy is the same as it is in Britain? Hi Alison, and thanks for you comments. When foraging for wild garlic, if in any doubt about what you’ve just picked simply smell your fingers! Those figures are just terrible, scary for the next generation too – as you say, where will they learn about the value of food or how to cook it? And even when the family meal has been prepared in all of 13 minutes, it doesn’t seem like many families sit down together to eat it anymore… see, you’re not the only one who can do miserable! The tartlets look good. We had something similar for tea tonight, with lots of slow cooked onions and chopped leaves from the garlic that I missed harvesting last year and is sprouting again. Hi Sarah. Caramelised onions make such a good base for a tart. If you factor in the length of time you took to make that and the time I took to make my wild garlic tartlets then it makes these figures even more extraordinary – the thirteen minutes quoted in Joanna Blythman’s book is supposed to be the average time now spent cooking the family meal! You have a wonderful blog and your recipes are really interesting and inspiring. I live in the french part of Switzerland and here I can find a lot of wild garlic. We name it “ail des ours”, bear garlic. Thank you for your lovely comments about my blog. Wild garlic seems to enjoy a wide variety of names – ramsons and wood garlic are ones I’ve come across before, but bear garlic is a new one for me. Best wishes to you too for the Easter holiday. I love the smell of wild garlic.It grows in a wood near us along with the bluebells. It’s one of the few things ( other than blackberries! ) which I would feel confident foraging for due to its unmistakable smell! As a novice forager myself I found Fiona Bird’s book “The Foragers’s Kitchen” very useful for helping to identify edible wild plants and for gaining an understanding of their seasons and potential uses. Thank you Steve, I will look out for that book. It sounds very good. We’ve grown wild garlic this year so that’s a really useful recipe. I did think about growing my own but a gardener friend of mine warned that it can pretty quickly take over, so you may need to keep an eye on it! Thanks Alison, I agree with everything you’ve said in your comment. We have met several times, but I’m not sure if you will remember me. I’m Paul and Bernie’s sister-in-law, Karen. Bernie e-mailed the link to your site as she thought I would like it, and I do – I love it! I have dipped into other food blogs from time to time, but I have to say yours is so aesthetical – a pleasure to look at (beautiful photographs) and to navigate and to read. I love the recipes, but I think the food politic preambles are perhaps more important, and thanks to you I am learning about important issues. I wanted to comment on this particular post of yours because the recipe sounds so delish, and I definitely want to try it, but I don’t think I would be able to find wild garlic at this time of year. My parents used to grow it their garden. About 6 years ago, they stayed on a caravan site at Chirk (where we went to visit them on our way home from staying in Worcester) and the woods surrounding the site were abundant with wild garlic, so my parents took some cuttings home with them, and planted them in their garden where it thrived. Unfortunately back then I didn’t try googling recipes, so just used the leaves as wrappers for cooking fish and vegetables (I don’t eat meat – haven’t for 32 years) but do eat fish and seafood. The leaves kept the food wonderfully moist, while also imparting a delicate garlic flavour. Unfortunately, my Dad suffered a massive stroke 3 years ago last May, and my Mum now cares for him 24/7. Dad used to grow a lot of things but Mum doesn’t have the time or energy for that now, so apart from tomatoes in the greenhouse, and the herb garden, everything else had to go, including the wild garlic. I can’t wait to try out some of your recipes – they all sound wonderful. I have over 40 vegetarian cookbooks, but don’t always try some out because I can’t see what they’ll look like – which is why I love the photos on your site. If you haven’t yet read any of Denis Cotter’s cook books (of Café Paradiso in Cork) I would definitely recommend him – although a lot of his recipes are quite rich/cheese based, but Phil and I particularly love his green pepper, black olive, parmesan and fennel pasta – even better cold than hot! I’ve signed up to follow your blog, and am looking forward to reading future posts, but being a newbie, I still have the pleasure of reading through your past ones. Great to hear from you, and thank you for your very kind comments. I’m really sorry to hear about your father, and the impact his stroke has had. I am sure it must be difficult for the whole family to adjust to his changed circumstances. I’m afraid you’ll now now have to wait until April or May for wild garlic. Where it does grow it is usually prolific. It seems to enjoy the same conditions as bluebells, so if you know of any local bluebell woods there’s every chance you’ll be able to track down wild garlic there. As my recipes are seasonal and there’s not much else ready to harvest at that particular time of year I’m sure I’ll be creating another wild garlic recipe in the early spring of 2015. I am familiar with Denis Cotter’s books, and I think his recipes are often really beautiful and packed with great flavour combinations. I also like the fact that he cooks by the seasons. Another favourite of mine that I’d recommend is Paul Gayler – his book “Pure Vegetarian” is worth putting on your Christmas wish list if you don’t already have it. Thanks again for getting in touch Karen, and for your lovely comments – it means a lot to me. 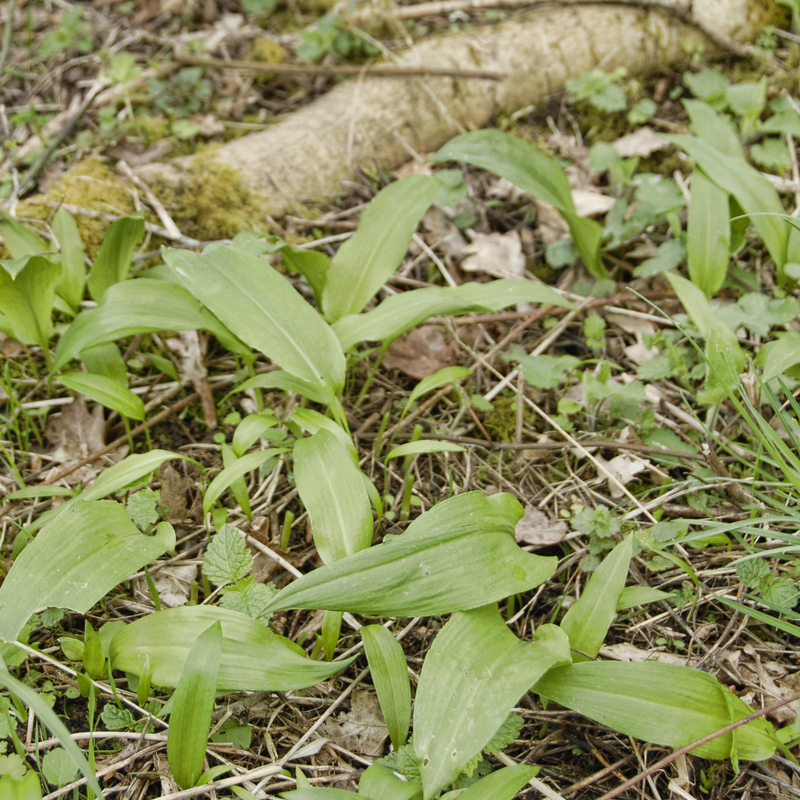 Wild garlic is also known as “ramps” in the US.